The planned development at Lisheen Mine which Deputy Jackie Cahill not wants to be connected to the gas line. 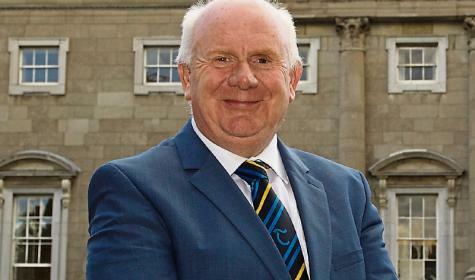 Tipperary TD Jackie Cahill has raised the issue in Dail Eireann of having Thurles and Lisheen connected to the National Gas Network. In a debate with the Minister for Energy, the FF Deputy presented the case for Lisheen, which is the designated National Research Centre for the Bio Economy, and Glanbia will be building a bio refinery on the site with a planning application already lodged with the council. “The research that was done over the past number of years by Professor Kevin O Connor and his team at UCD, and the pilot work done by Glanbia will result in the by-products of the agri and agri-food industry being manufactured into high value, globally traded commodities. “This production, as it develops, will be to the 21st century what oil was to the 20th and we are ideally placed in Tipperary to be world leader in the area. The site, as far as all the stakeholders are concerned, is ideal. It has scale; it has high voltage electricity; it has green energy available; and it has a water supply to match the size of the site. “However, the last piece of the jigsaw is the connection of the site to the National Gas Network and I was delighted to begin that process in the Dail,” Deputy Cahill told The Tipperary Star. The experts at local authority level and nationally all agree that when this connection is made it will make the site attractive to the pharma and food industries. It has the potential to act as a hub for the international data centre industry, similar to the project that was lost in Athenry. All of this as an addition to the bio economy activity already established on the site. It is considered that this site can be the location for hundreds of jobs. “The Gas connection can come from Cashel at an approximate cost of €10 million. The shortest distance from Cashel to Lisheen will run adjacent to Thurles - therefore to connect the Town of Thurles will offer Irish Gas economies of scale. Thurles will be the nearest urban centre to Lisheen and will act as support for its development by way of housing and supply of services. “The connection however can transform Thurles. It will offer cost effective energy to our Thurles SMEs like Premier Green Energy, part of the OMC Technologies Group and Dew Valley Meats. It will offer cost effective energy to all businesses and homes. The connection has the potential to make Thurles attractive again to all kinds of Industry and reverse the trend of thirty years in the town. “I proposed that a robust feasibility study be done as quickly as possible. The feasibility study must have input from all stakeholders, the Department of Energy, Department of Jobs, Department of Agriculture and Tipperary County Council. The cost of the study is about €90,000. This study if, done efficiently, could allow an application to be made to the €500 million Climate Action Fund for the €10 million funding required to connect to the Gas Network. The project is an ideal fit for the Climate Action Fund as Ireland has a target to reach, whereby 30% of all gas used in the country must come from bio or green gas within the next ten years. Lisheen can go a long way to achieve this. The fact that the site would be connected to the gas network would allow the bio gas produced on site to be piped back in to the national gas grid. “This project can be a shining example of how we develop rural Ireland and could be the template for future development right around the country. “However, from our point of view here in Tipperary, it is a chance to attract industry that would not be interested in Tipperary without the set of circumstances that are now presenting to us. It is critical that we recognise the opportunity and grab it with both hands. Lisheen is at the heart Fianna Fail Policy,” he said.